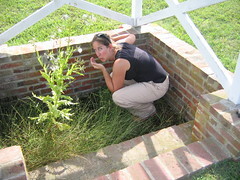 Since our Delaware trip marked the 10th year of Roadchix travels, we figured we could use a stop at the fountain of youth to remember and reclaim those days that we began our journey to becoming road-hardened-warrior-babes. Luckily, the waters of eternal youth are in Delaware! Armed with only a small photo and general description of the area of Lewes it could be found in, we crossed our fingers and kept our eyes open. As with so many of our travels, luck was with us and the white gazebo came into view. Strangely, there was no parking, so we scooched over to the shoulder of the road to go in for a closer look. Upon closer inspection, the "fountain" of youth was nearly dry so Beth had to dive deep to absorb some of that anti-aging water, er. . . mud. . . that flowed beneath it. 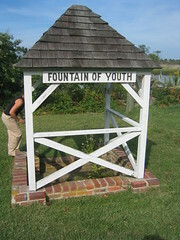 The Fountain of Youth was supposedly discovered by Dutch settlers in 1631 and the gazebo was errected in 1937. The lack of parking probably encourages people to drive by instead of stopping, but since that has never stopped a Roadchick we were happy to get a glimpse. However, since our birthdays have both come on schedule, I can't speak to the effectiveness of our visit.